When the Bureau of Land Management hosts a public meeting such as the one on Jan. 22 in Minden, Nevada, to discuss the Carson City District's draft resource management plan...make no mistake about it...the agency does not really care what the public thinks. They denied the public in attendance any chance to speak on the record. Instead the public was made to feel like they mattered by being allowed to walk around to different stations where BLM specialists justified parts of the draft resource management plan, like John Axtell, Wild Horse and Burro Specialist for Carson City District. For instance part of that plan calls for 4.8 million acres of public land in the Carson City District to continue to be available for livestock grazing and for a decrease in wild horse and burro herd areas from a 1.2 million acres to 1.07 million acres. Yet only 1 out of 17 of the herd management areas in this planning area has an appropriate management level set of 500 or more. Friends of Animals' employees, Edita Birnkrant and Nicole Rivard, traveled across the country to speak up for the wild horses and instead got a taste of what it feels like to be a wild horse in the United States-we were rounded up and tossed aside like garbage. After the BLM staff gave a brief introduction about the plan, Edita Birnkrant, FoA's campaigns director, ran up to the podium microphone to say some of the things she thought she would be allowed to say during a public comment period since this was a public meeting after all. She started off by saying "Friends of Animals is charging the BLM and ranchers with crimes against wild horses" and she held up a yellow strip of crime scene tape and then said "The BLM is managing wild horses into extinction through roundups and PZP and we are outraged." She also held up a banner that said "Stop the BLM's Criminal Reign of Terror; Protect Wild Horses under the Endangered Species Act." After a minute the microphone was turned off by the BLM but Birnkrant kept loudly stating her indictment of the BLM's criminal mismanagement of America's wild horses and started walking around the room holding the large banner. Birnkrant was soon corralled by four sheriffs, and eventually the owner of the Carson Valley Inn Casino, who rudely told us to stop filming the incident and then forced us out of the meeting room and out of the hotel. The owner and sheriffs actually followed us-paying guests- to our rooms and demanded we pack quickly or get arrested. So what FoA has learned from attending a public hearing is if you say anything that suggests wild horses have more of a right to be on public land than sheep and cattle, it is frowned upon. If you speak out against roundups and PZP-pushing-or tell the truth that BLM keeps wild horse populations so low that the loss of genetic variation is a real concern-you will be silenced. Wild horse hatred is rampant in the BLM. As FoA stood in line before the meeting started, Birnkrant overheard a man telling a BLM employee: "I want to open up a horse butcher shop," and then other men standing next to him joined in saying "horse meat is the most tender" and the BLM staffer just laughed. 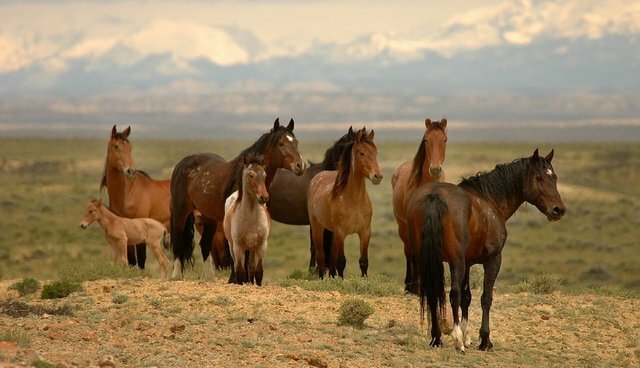 FoA will continue to fight for wild horses to gain protections under the Endangered Species Act, so BLM doesn't manage them to extinction, and wild horses will have the last laugh.